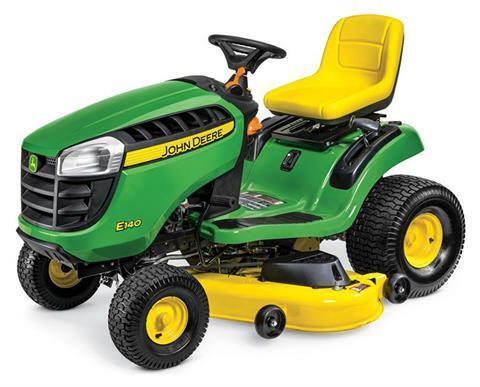 Built in Greeneville, Tennessee, our 100 Series lawn tractors are our affordable, comfortable, easy-to-use lawn tractor line-up. Engine is powerful and smooth-running V-twin design. Frame made of full-length welded steel for reliability. Cast-iron front axle will not bend. Hydrostatic transmission gives an infinite choice of ground speeds. Operator station designed for comfortable operation. Instruments and controls are easy to find and convenient to use. Serviceability is convenient with an easy-open hood. The Edge cutting system gives superior performance. CargO Mount™ system makes installation of rear bagger and other attachments easy.